Dense Asphaltic Concrete is used globally to line upstream dam faces, reservoirs, channels and landﬁll. For over 50 years it has also been successfully used as a specialist method of constructing an impermeable central core liner to seal large embankment dams. Acting as specialized sub-contractor for client Agder Energi, WALO worked on the construction of two such dams being built at a hydro power plant in Norway. Located in Aseral, 80km north of Kristiansand in central Southern Norway, 843m above sea level, the two dams encircle a reservoir for the production of hydro electricity. WALO has had total responsibility for all the asphalt works involved, including the production of the material. Owing to the extremely remote location, WALO installed an asphalt mixing plant at the site when commencing work at “Skjerkevatn Damer”. This reduced the costs that would have been involved transporting material from a great distance and saved a huge amount of time. It also meant that WALO could maintain total control over the optimum conditions for producing the unique asphaltic design mix required by the project. Despite the fact that the two dams “Skjerkevatn” and “Heddersvika” had to be constructed simultaneously, WALO managed to complete the works ahead of schedule by using one ﬂexible placing group. The project was completed within a nine month construction period, split over two summer seasons. A watertight wall was constructed in the axis of the embankment using DAC, which is placed simultaneously with the embankment earthworks. 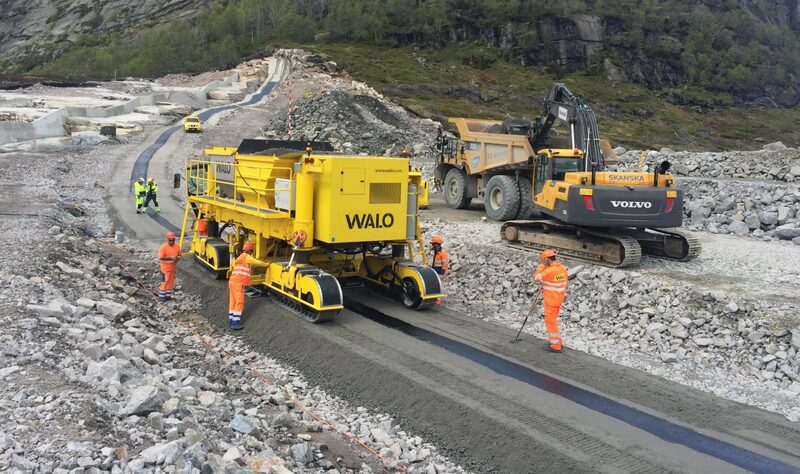 The asphalt and the materials for the adjacent transition layers are placed into a core ﬁnisher – a highly sophisticated, technologically advanced machine, specially developed for this task by WALO’s engineers. The core ﬁnisher travels along the embankment axis and applies both the asphaltic concrete core and the two transition layers or ‘ﬁlter zones’ to the center of the structure at the same time in just one pass. The asphalt layers are laid in layers of 200 – 250 mm and are heated using infra-red heating appliances, enabling them to be perfectly sealed. The core ﬁnisher applies the initial compaction to both the asphalt core and transition layers, with the ﬁnal compaction being made with vibrating rollers. As the core is installed at the same time as the embankment earthworks, painstaking coordination of all the different activities on site is crucial. Particular attention has to be paid to the exact placing of each layer and the connection to the concrete foundation under the core itself. The new dam at Skjerkevatn is 450 m long and 50 m high, making it the largest dam project undertaken in Norway for many years. The core liner is between 500 and 400 mm thick and used 4.200m3 of DAC. The second dam at Heddersvika has a crest length of 575 m and is 27 m high requiring 3.800 m3 DAC.